In the 1900s and 1910s it was the fashion among many papers to print comic strips only in their afternoon/evening editions. The reasoning behind this is a mystery to me. My best guess is that the evening editions were designed to appeal to the casual buyer on the street. In addition to the inclusion of comic strips, evening papers also tended to contain more sports coverage, the headlines more punchy, and the stories shorter and snappier. These differences might have been to make the paper more attractive to people on their way home from work who were looking to be entertained by the paper in addition to being informed. In any case, when faced with a paper sporting two editions, I normally don't even bother looking at the morning paper - the good stuff is almost invariably found in the afternoon editions. The New York World is a case in point. The Evening World was brimming with comic strips, while the morning edition (just titled The World) was, I thought, bereft of such delights. Well, turns out that my comic strip radar was a little off, because the World did on occasion run comic strips in the 1910s. Based on my research so far, no more than one strip ran per day, and on many days there were no strips at all. 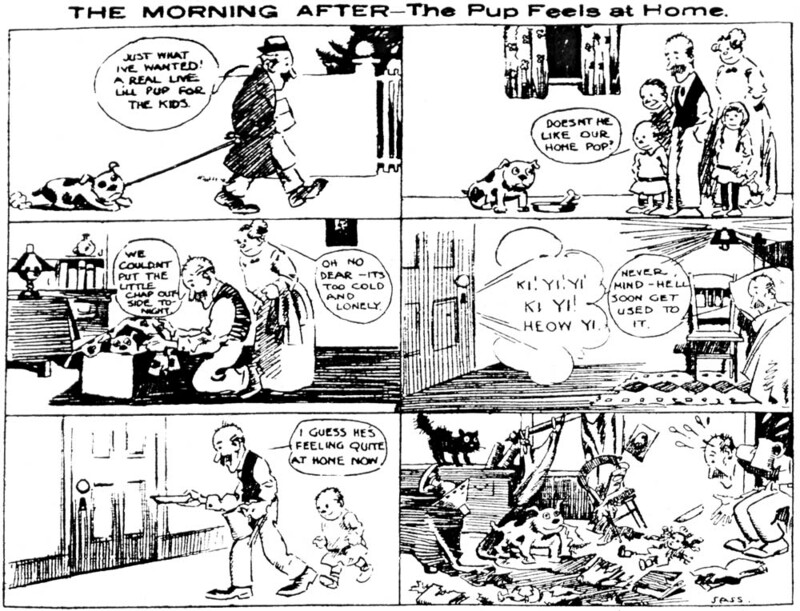 In fact, it appears that the comics pretty much petered out entriely in 1914, with the exception of the panel cartoon Metropolitan Movies (know outside of New York as Everyday Movies) , which ran in the morning edition for many years. One of the last strips to run in the morning edition was The Morning After. It was penned by someone who signed themselves Alex Sass. Sass seemed to specialize more in news cartoons (not editorial cartoons, but cartoon depictions of real news events), a cartooning genre that pretty well died out in the 'teens. 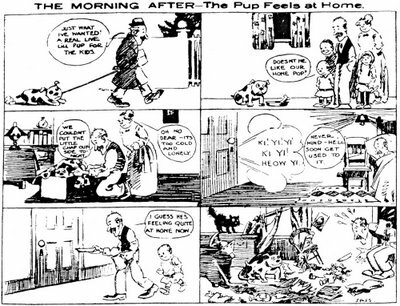 The Morning After ran just five times in January 1914, and was Sass' only continuing comic strip for the World. English-born Australian artist and cartoonist. He drew cartoons for Melbourne Punch from 1890 to1912. He moved to New York, where he cartooned for The Globe and The New York World. He returned to Australia after two years to work in advertising. He was the third artist to join the art staff of Smith’s Weekly and served as the newspaper's original art editor. He died in Sydney in 1923, while on the staff of Smiths’ Weekly. Came upon this poem in the Cleveland Leader of July 30, 1916. Don't know if Marquis ever included it in one of his books. The amazing thing to me is that the Toonerville trolley made such an impression on him this quickly. The earliest trolley cartoon I have found in Fox's panels was in February 1916, just five months before he wrote this poem. Has anybody seen trolley cartoons from earlier than that? The Trolley that Meets all the Trains. "Perhaps I'll connect with the next!" If I then missed the next one, no matter! Should fail to meet some of the trains. You can't impress me with your swank! My corpse is no common remains! The Trolley that Met all the Trains!" The Minneapolis Journal didn't have a Sunday edition way back when, so they simply ran the traditional Sunday features on Saturday (much like those Minnesota neighbors, the Canadians, do). Charles "Bart" Bartholomew was the sole overworked cartoonist on the Journal in the early years of the century, and he made quite a name for himself in the midwest as an editorial cartoonist. But he also contributed features to the children's section of the paper on Saturdays. His usual dose was a front page panel cartoon, a few additional illustrations inside the section, and a large comic strip or panel cartoon for the back cover. Most of these back page features were one-shots, but he also indulged in the occasional series, of which today's Shanghai Twins was the first. It first appeared on October 27 1900, and ran four times, the last on February 2 1901. In this period all of Bart's back page features took the same form, two panels with rhyming text. The rhymes were likely supplied by W.A. Frisbie, who didn't take credit on these early features but did later on. Bart's most lasting claim to fame was his correspondence cartooning school, whose ads were fixtures in Cartoons Magazine and elsewhere. Jackie Ormes has acquired some interest from comic strip fans for her Torchy Brown series (see a sample here), mainly because of the strip reproduced in an old issue of Nemo. But Torchy was hardly more than a blip on Ormes' map. Patty Jo 'n' Ginger was her bread-and-butter cartoon, and it lasted more than a decade in the Pittsburgh Courier and other papers. I trust that the appeal of the panel needs no explanation. Patty-Jo 'n' Ginger started on September 1 1945 and ended on September 22 1956. Near the end of the run the panel appeared only sporadically in the Courier.